My grandmother once told me that one of the greatest things about having kids is that you get to grow up all over again, and so far my experience accurately reflects that advice. While I work in an industry where it's common to see thirty-year-old men and women wearing Batman t-shirts playing with Legos and arguing about cartoons, there's something about playing with my kids that connects me more intimately with the joys of my own childhood than anything I do with my cynical friends and colleagues in the videogame industry. Part of it is the complete lack of pretense in my children's imaginary worlds, where cowboys and dragons and rockets and superspies can exist side-by-side, unshackled by genre boundaries or "mature" expectations. The bigger part of it is helping the people I love most and whose happiness is my life's goal to discover one of life's purest joys. Apart from the emotional satisfaction in it, there's a lot to be learned from watching children play. We may use the term "child's play" to suggest something easy, but the truth is that real child's play is a serious business. I don't mean serious in terms of its ultimate consequences, but when you look at the commitment kids make to whatever imaginary dramas they've created, it's clear they're operating under the assumption of tremendous significance. 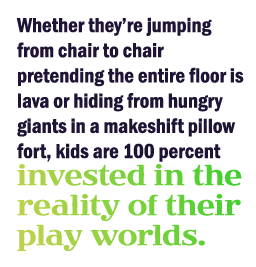 Whether they're jumping from chair to chair pretending the entire floor is lava or hiding from hungry giants in a makeshift pillow fort, kids are 100 percent invested in the reality of their play worlds. A lot of people naturally assume that my kids are exposed to a lot of videogames but it's not true. While I don't actively discourage their interest in what they call "Daddy's work," I don't go out of my way to make videogames a big part of their day-to-day life. My kids' ability to fabricate elaborate scenarios entirely out of their heads makes the world of most videogames seem narrow in comparison. Of course, comparing horsey-back rides across the living room floor to something like John Marston's exploits from atop his Kentucky Saddler in Red Dead Redemption isn't easy. Each offers a different kind of freedom and depth, but like Red Dead or Assassin's Creed, the make-believe worlds of a child's imagination emphasize setting and character as much as (if not more than) pure mechanics. When my son, who is five years old, latches on to a game, it's inevitably because it has a form that appeals to him; the rules are a secondary consideration, if they're even considered at all. If he gets to be Curious George or Lightning McQueen, that's good enough for him. Games that have a context he's less familiar with, say Lego Star Wars for instance, just aren't as compelling for him because there are no real hooks on which to hang his invented narrative. And without that crucial component of identification, no amount of arresting gameplay seems to move him.